Hello my lovelies! While it’s true that I’ve neglected my bento site for many years now, I still do make bento (though in much simpler forms than previously)! 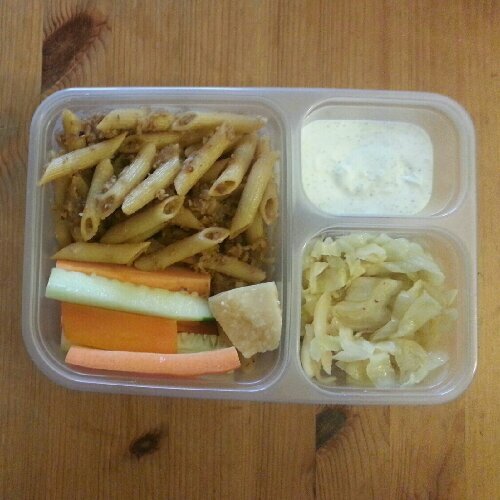 Wow, I can’t believe I started bentoing over 5 years ago now… and stopped over 2 years now… Not working in an office and with slightly more flexible work hours has really affected that. I don’t tend to make bento when I work from home, but I also work in a restaurant and to prevent myself from getting super fat eating everything there, I bring lunch and try not to eat outside of that. 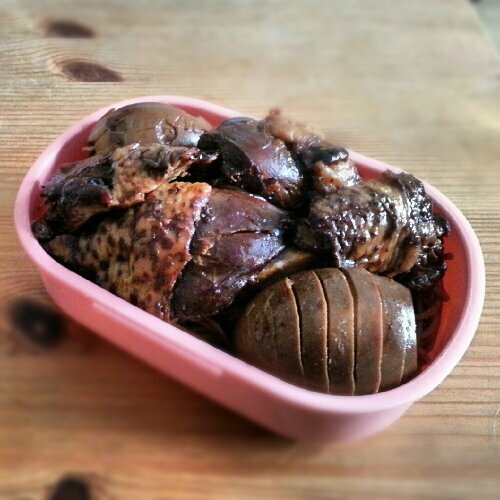 So… here are photos of the bentos I’ve had over the past month! 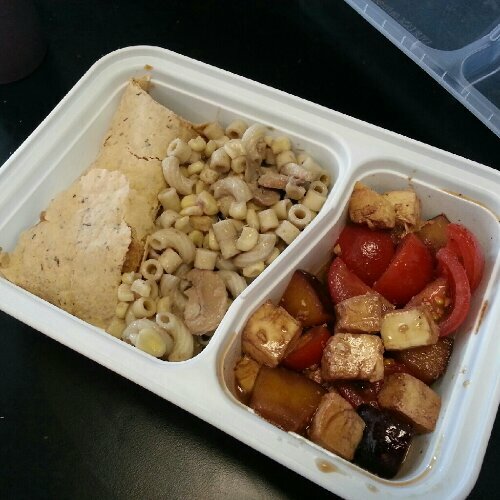 Wrap with peanut butter and Fritos inside – yes, I did – mish mash pasta with artichoke garlic cream, mushrooms, and corn, and a fresh mozz, Sappori tomato, and plum salad with Cherry Gold balsamic vinegar. I don’t usually think to add fruit to these things but I was glad I did, everything was this perfect combination of sweet/savory. Leftover sesame noodles, sliced black plum, roasted broccoli, black grapes and caprese pasta salad (penne with sundried tomatoes, fresh mozz, pesto). 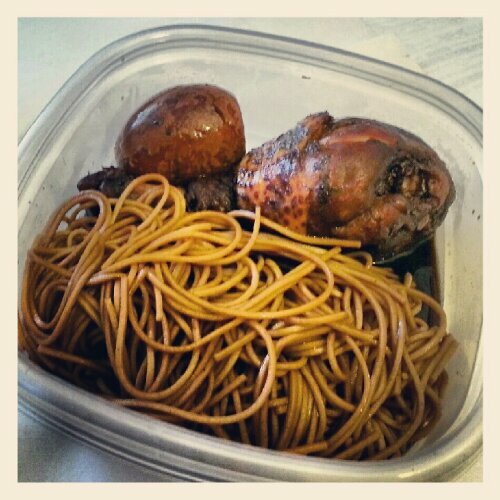 Soy sauce chicken & egg, soba dressed with the soy sauce mixture. 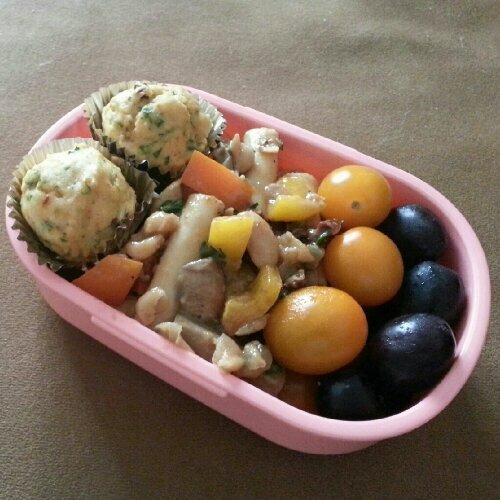 POST muffins (Parsley Onion Sundried Tomatoes), white bean ziti salad, Sungold cherry tomatoes, and black grapes. Last of the soy sauce chicken and eggs over soba (chicken taken off the bone and placed on top of the soba). My type of bento at home! 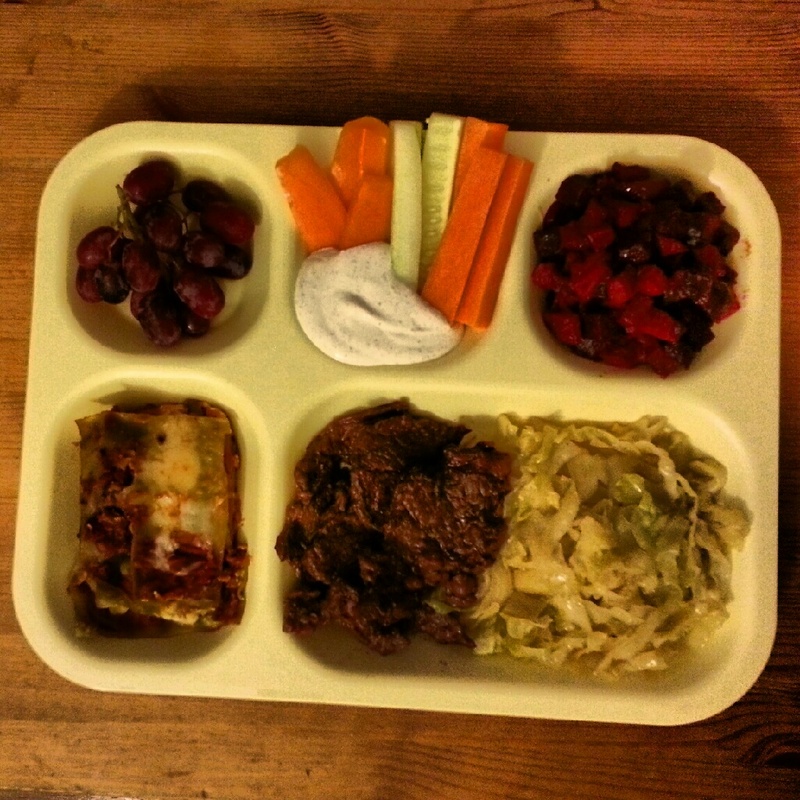 Or “Reinventing the TV Dinner” – hey, the new season of television just started! 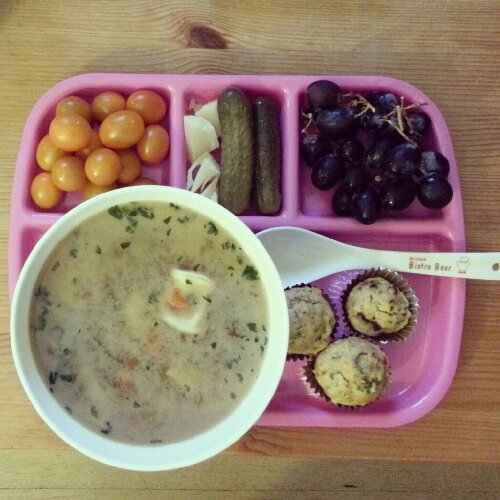 – more Sungold cherry tomatoes (my favorite), Piave and small pickles, cluster of black grapes, more POST muffins, and a big bowl of simple tortellini soup. 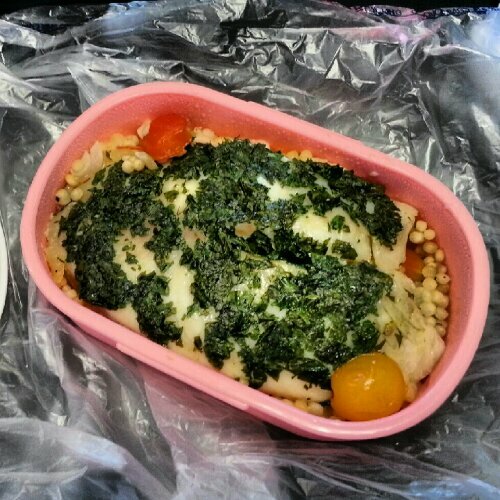 Tilapia over cous cous cooked en papillote (tin foil packet with parsley butter and more tomatoes, onions). Really tasty and easy. A single pork meatball; tangerine (that sort of looks like a bread roll, haha); roasted root veggies next to maple sausage kimchi fried rice; chicken pot pie in a puff pastry shell; tomatoes. 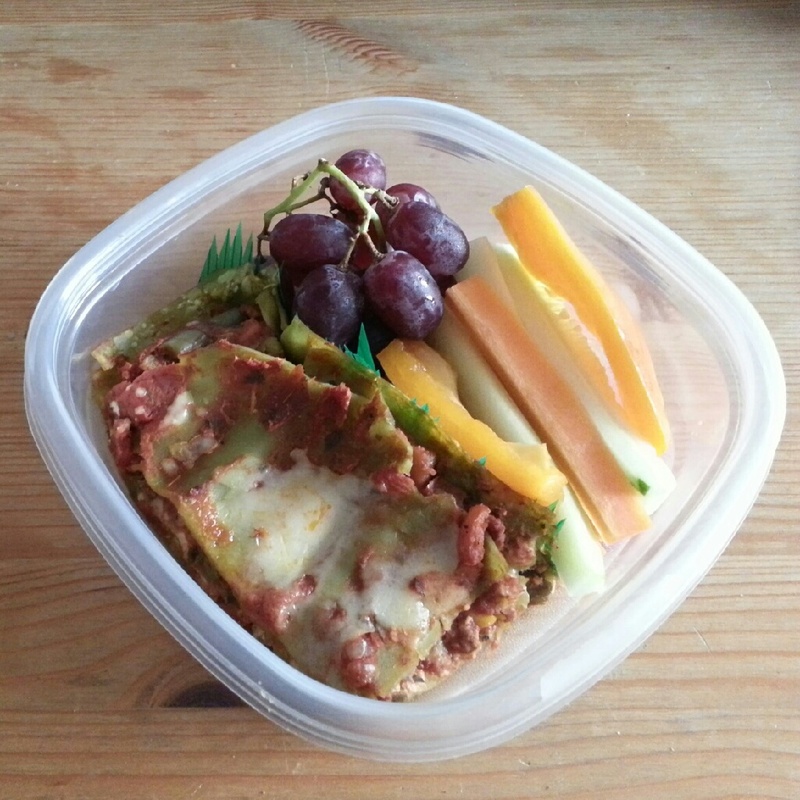 Spinach lasagna (as in, the noodles are spinach); red grapes; cut up orange bell pepper, carrot and cucumber sticks. Cluster of red grapes; veggie crudite with ranch dressing; roasted root veggies; lasagna; bulgogi and honey chipotle butter braised cabbage. Penne with sardines, buttermilk biscuit breadcrumbs/parm, Meyer lemon, and lemon juice; veggie crudite; hunk of Parm; ranch dressing; chipotle honey butter braised cabbage. Phew! Yeah, I like to eat. What have you guys been eating at home? pb and frito wrap? Let’s get married. Very nice on all sorts of levels. Nice to see the bentos again from you as well as all the unique foods as you go through your pantry. I was just looking at the pics trying to figure out which are the pantry items… pasta, of course. Artichoke garlic cream, peanut butter, balsamic vinegar, sundried tomatoes, pesto, soba, soy sauce, tortellini, matzoh, maple sausage, kimchi, rice, puff pastry, tomato sauce, bulgogi, ranch dressing mix, sardines, butter, parm. Okay, I feel better that I really am going through my pantry now! Do you eat the fish cold? I actually made the fish that morning, so I cooled it a little bit before I sealed the box. I ate it room temp a few hours after I cooked it. I’m so glad to see the interesting bentos you’ve created again! I was sad when you stopped posting on your bento site. 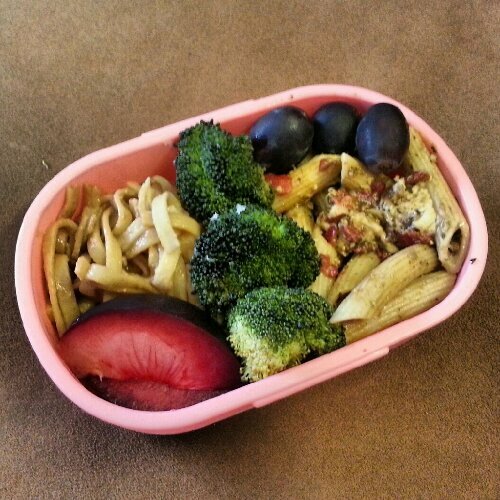 Well, when I first started making bento, it was a challenge to use the same box in new ways. It makes it easier to keep up – not sure if you have a dishwasher or not (the boy?) – but personally, with so many boxes to choose from, sometimes I start stacking them in the sink and then at the end of the week I have so many boxes to wash! So with only one, you’re forced to keep up with the dirty dishes, so to speak… Of course, this is different for everyone. haha You’re not helping! If I buy more bento supplies, it would negate the money saved while packing bentos for lunch! Well, he puts it in the sink/soaks it if needed when he gets home from work and then I wash it while cooking dinner. And oohhh, I wouldn’t mind used bento boxes if you don’t mind parting with them. Thanks! 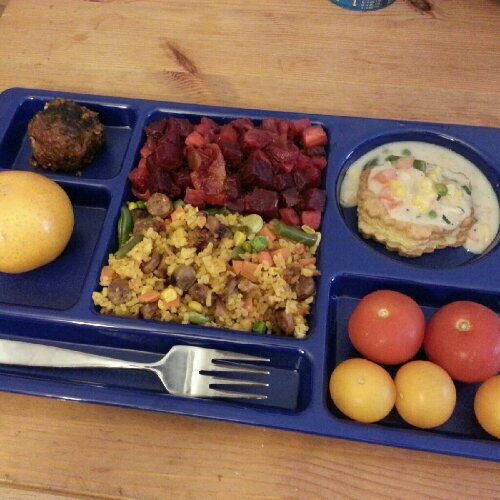 I have a quasi-bento at school today–4 little cups with sliced bell peppers, granny apple slices, PB2, hard boiled eggs, and corn muffins. I realized that I store too much food. So I’ve started to go through my pantry and freezer in anticipation of my move in a year. Hahaha! Exactly… it’s a lot of stuff!